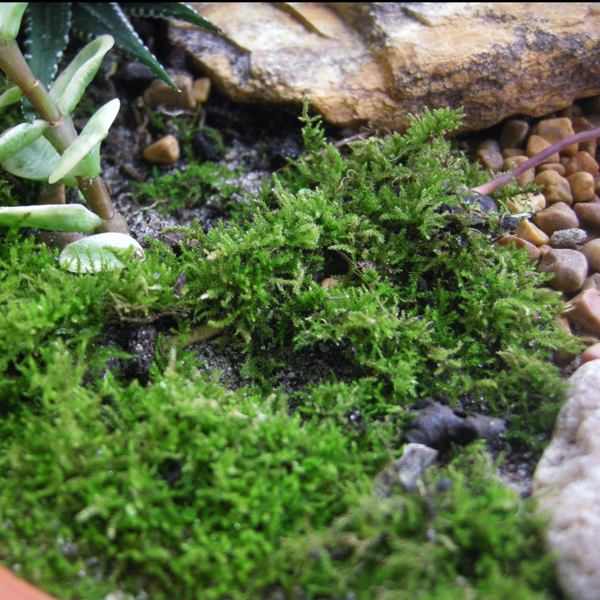 Moss is such an important part of a miniature or fairy garden. It holds the soil in place, creates a realistic grass-like effect, and helps to protect the roots of the other plants that may be in the same container or surrounding the fairy garden. 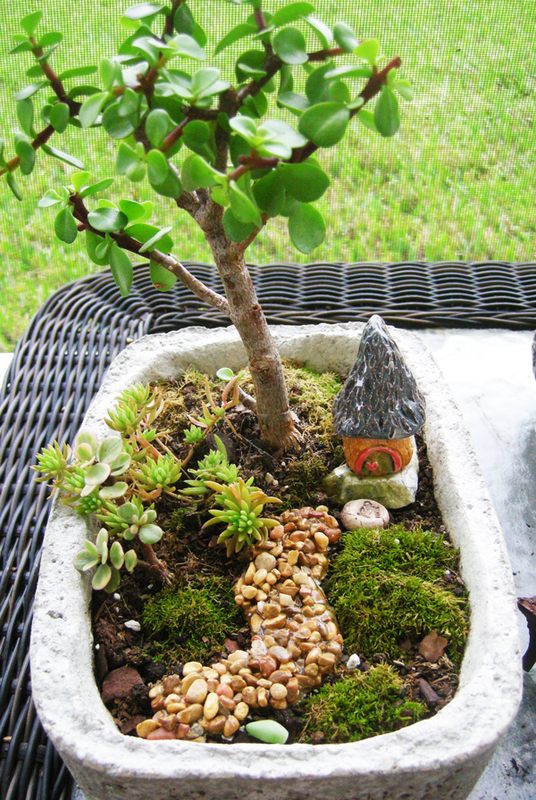 I have included a few photos of moss I have added to some of my fairy gardens. Here in Florida I can harvest moss almost anytime of the year. We have a very moist area on the north side of our home which always has new moss spores growing. I scooped the moss up with a garden trowel, and sometimes I just use my fingers. Once it is established in one of my miniature gardens it looks remarkably like a tiny lawn. I keep my small container fairy gardens on the east side of our home, which is our back yard. The plants get morning sun, but are well-shaded in the hot afternoon sun. They are watered only enough to keep them moist. I try not to over water, and I work hard to keep them from drying out completely. However, I have found that moss is pretty sturdy stuff. If it does dry out and turns a little brown, additional water will perk it right up. Sometimes you may find small weeds starting to sprout in the moss. I use tweezers to gently lift the unwanted miniature invaders so as not to disturb the moss. I have found that once the moss is well-established it it difficult for the weeds to get a good foothold. 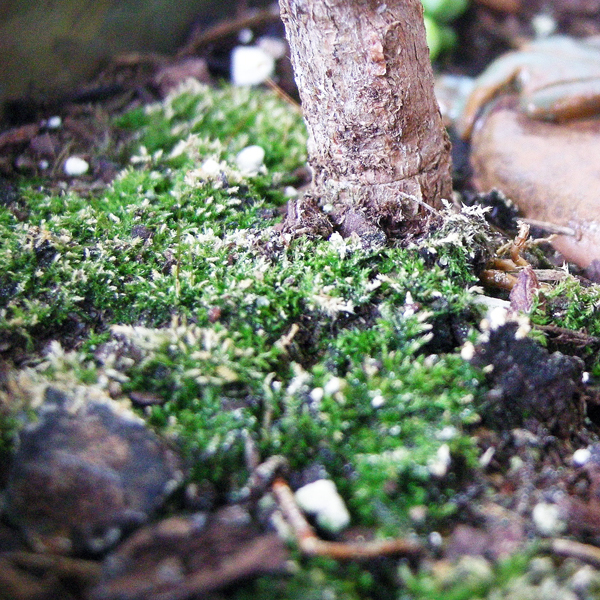 This close up view of moss under one of my “fairy trees” (a miniature jade) is pretty new and just getting established. As you can see from the other photos, once it gets established it will fill in, thicken up, and really look nice. 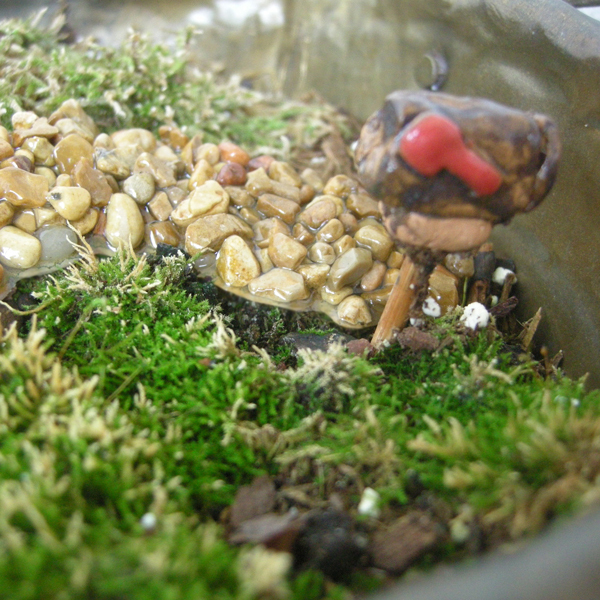 The last photo is one of my very small fairy gardens in a container made of “Papercrete”. More on that in another article, but you can see here how mice the moss looks when set into a scene of miniature plants and fairy garden items. I found a very good article on how to collect moss that I wanted to share with you. The article addresses how to collect and care for your new moss to help it get established. It also notes how to care for the two main types of mosses. The website is one to bookmark as it has a vast amount of information on growing moss, moss types, etc. I hope you enjoy this. Thanks for visiting.